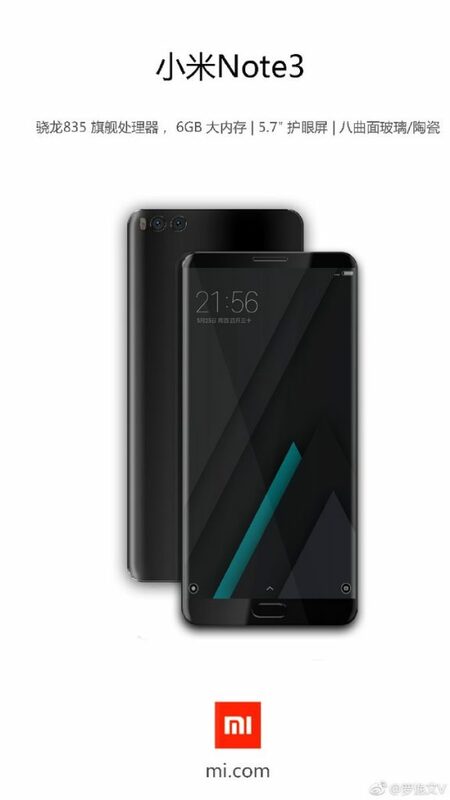 Xiaomi Mi Note 3 Render Leaked; Reveals 5.7-inch Screen, SD 835, Dual Rear Cam, Ceramic Body - Playfuldroid! The Xiaomi Mi Note 2 was released in October 2016 alongside the Mi MIX. The Mi Note 3 will is speculated to arrive by October this year to succeed the Mi Note 2. A leaked poster of the MI Note 3 that has been allegedly taken from Xiaomi’s site has appeared. As it can be seen in the above image, the alleged Xiaomi Mi Note 3 is showing gracing a horizontally arrange dual rear camera module. The phone has a dual-edge curved display which indicates that the phablet will boast a higher screen-to-body ratio. The overall design of the phone is not different from the Mi Note 2. There is no confirmation on whether the render is real. However, the text present on the leaked poster shows that the flagship phone is driven by Snapdragon 835 chipset and it features a 5.7-inch display that is flanked with a curved glass. Also, the phablet sports a ceramic rear. Previous leaks have suggested that the flagship phone would be sporting monstrous specs. Some of the other rumored specs include 8 GB RAM model, 128 GB and 256 GB storage choices and 4,070mah battery.